An all-new LEGO adventure featuring Marvel’s superheroes is now available on the Nintendo Switch. In LEGO Marvel Super Heroes 2, Kang the Conqueror has traveled through time to steal numerous Marvel cities and locations, forming his own expansive Open Hub World of Chronopolis. To stop him, an elite team of Super Heroes must band together in a cosmic battle that takes players on an exciting journey across the Marvel Universe. There’s also an all-new mind-bending time manipulation mechanic to play with as you explore the huge, open-world game. Players will have the opportunity to travel everywhere from the mythical land of Asgard to the deep space base of Knowhere, not to mention 2099 Nueva York, Old West, The Swamp, and Xandar. 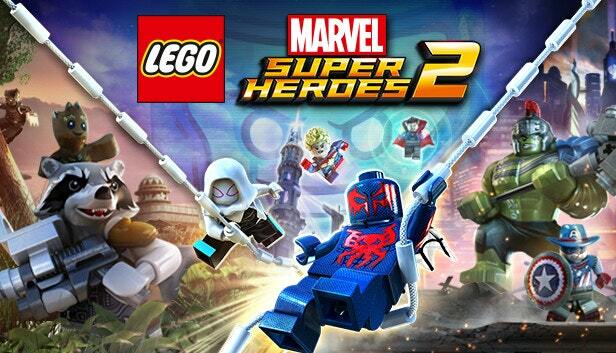 LEGO Marvel Super Heroes 2 features a four-player local multiplayer mode, so four players can come together to play as one of a huge array of characters from the Marvel Universe. Characters include the likes of Ant-Man, Black Panther, Captain Marvel, Cosmo the Spacedog, Cowboy Captain America, Doctor Octopus, Doctor Strange, Ghost Rider, Green Goblin, Groot, Gwenpool, Hawkeye, Howard the Duck, Hulk, Iron Man, Luke Cage, Ms. Marvel, Rocket Raccoon, She-Hulk, Spider-Gwen, Spider-Man, Star-Lord, Thor, and many more. LEGO Marvel Super Heroes 2 will also have DLC to further expand the game, with a Season Pass coming soon that includes six Level Packs and four Character Packs. The packs include content from Guardians of the Galaxy Vol. 2, Black Panther, and Ant-Man and The Wasp, as well as comics-inspired content. The Character Packs will add more than 60 new characters to the main game’s roster of over 200 Super Heroes and Super Villains. The Season Pass will be available separately or as part of the LEGO Marvel Super Heroes 2 Deluxe Edition, which comes with the main game, Season Pass, early access to the Classic Guardians of the Galaxy Character Pack, and an exclusive Giant-Man LEGO Minifigure. Which is your favorite Marvel hero? Check out the launch trailer below and let us know if you’ll be picking this game up today.